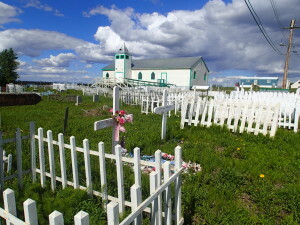 We left Inuvik back on the Dempster on Thursday morning while it was still bright and sunny but by the time we got to Fort McPherson ( ¼ of the way) there were big storm clouds coming at us. We sought refuge in a small café and wanted to sit out the storm there. After 2 hours of heavy rain and finding out that a hotel room in this little town would have cost us $210 we thought we’d better get going. The road was totally soaked muddy and slippery…a bit of a challenge!! 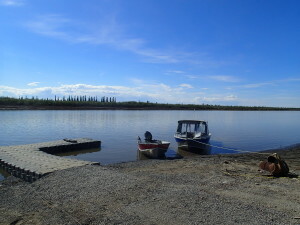 We spent the night at a campground almost half way back on the Dempster. I must mention that this is the only way to get to Inuvik so whoever you meet at the beginning of your journey, you will certainly run into again many times cause..well you just can’t avoid it. So needless to say we met our “French Girls” Michelle and Sylvia many times and every time there was a big hello, hugs and welcome. 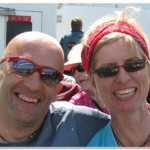 We all had a big laugh, said our good-byes many times! 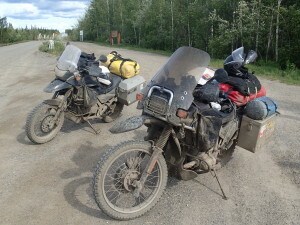 So to sum it all up the ride back was basically dirty, muddy, cold and…not as pleasant as the ride up to Inuvik. Our bikes were covered from top to bottom in brown mud and so were we. We celebrated our safe ride back to Dawson City on Friday night with a dinner at the “Drunken Goat” ( a Greek restaurant) and decided to take two nights in Dawson to rest and relax. Saturday morning we took the bikes to the Dawson car wash and it took 2 hours to wash off the mud from everywhere. Both Heinz and me said we should just drive through a car wash stayed on the bikes so everything including us would get a clean up! The rest of the day was spent with relaxing at the campground and talking on the phone to the kids to get an update from home. After supper we walked to Dawson town to get an ice cream and…guess who we met?? 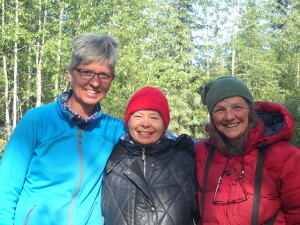 Our new French friends Michelle and Sylvia…again. 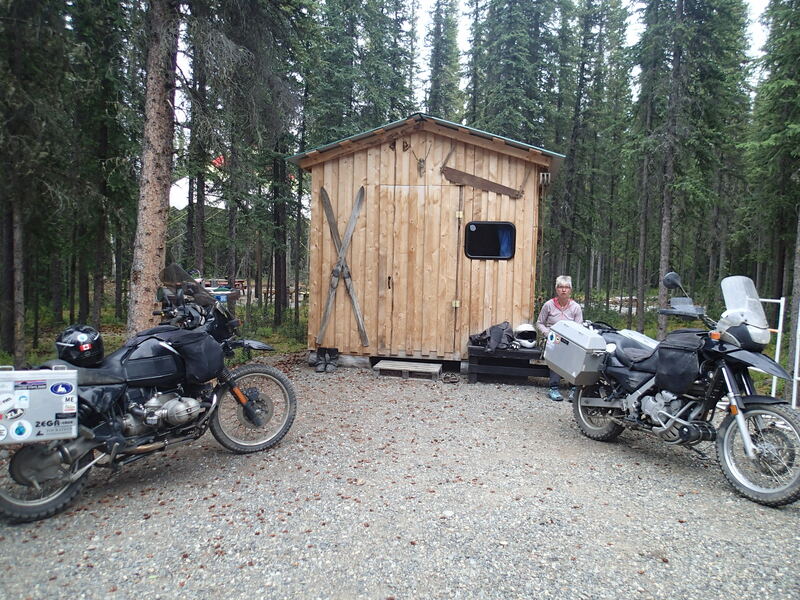 We found out about a campground for motorcyclists in Tok and settled in with Vanessa at her Thompsons Eagle’s Claws campground, a neat place for bike travellers. 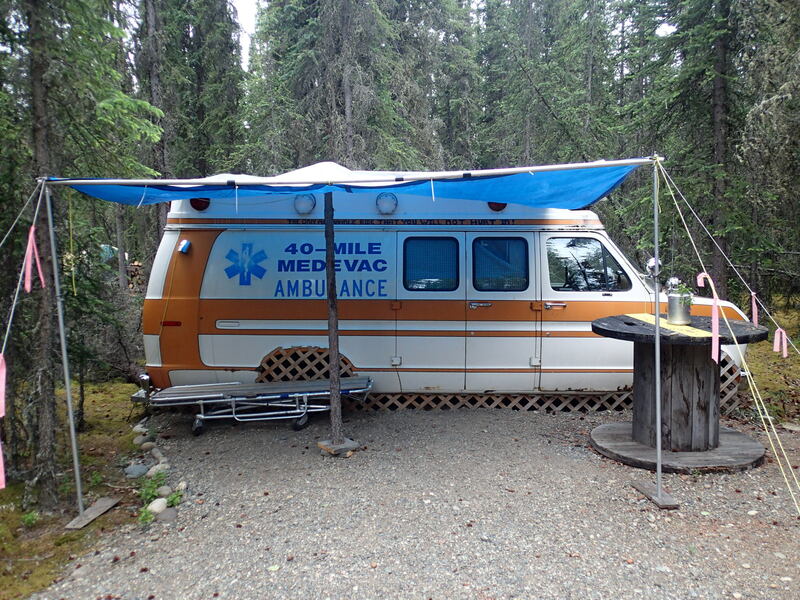 You can rent a tent space, a cabin, a teepee, bunk bed or you can stay in an old ambulance van. Very unique – welcome to Alaska. 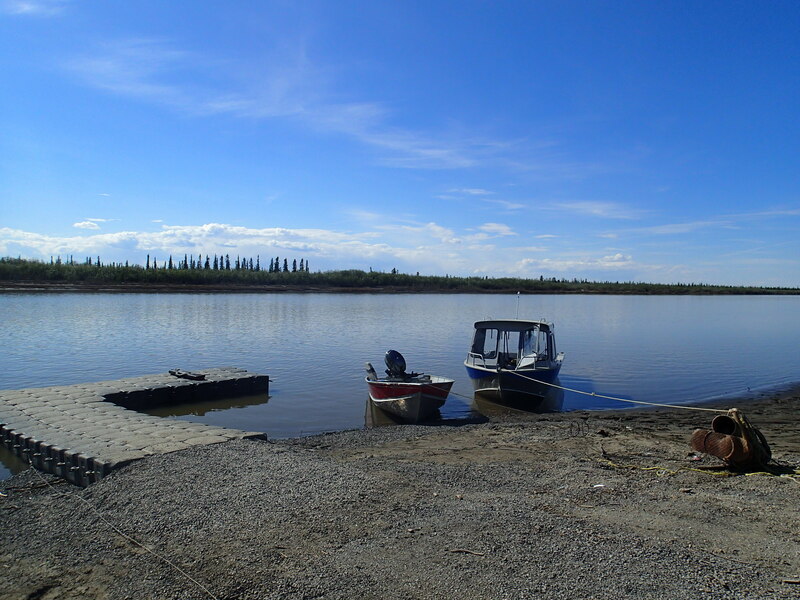 Planing on moving on towards Fairbanks but just heard about various wildfires and highway closures in the area, so we have to check the situation tomorrow. My Goodness, you ARE adventurous! So nice to follow your trip; now you’re back on “known” turf and I follow, and remember our own trip, in thought. 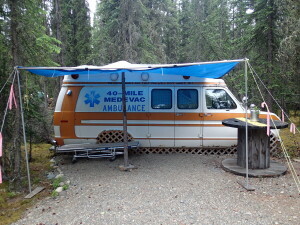 What an idea to make an old Ambulance into a trailer. Hope you’re feeling good again, Feli and back in full enjoyment of this trip! Keep on writing and letting us share your adventures. Hugs!